I’m excited to participate in the Five Favorites link-up again this week with Hallie at MoxieWife! If you haven’t joined in the fun yet, you should! It’s so much fun to read everyone’s favorites and discover new things and common interests! My brand-new CND Shellac kit! I’m definitely considering this my splurge purchase of 2013! I sold some of my Silpada jewelry from when I was an independent representative, so I could invest in this kit to do my own Shellac nails at home! Even though it is pretty expensive (at least I scored it at the lowest price I had ever seen two weeks ago), I know it will last awhile and it is sooo worth it to not worry about chipped nails for 2 weeks straight! When I did this for the first time the other night, it was weird to not have to wait for my nails to dry! LOVE IT! I’m almost finished with this insightful book by Fr. James Martin. It has been very interesting to read how specific saints have had an effect on his life and vocation as a priest! 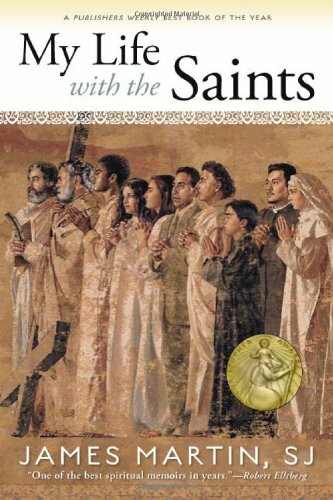 It has motivated me to read more biographies on the saints. My little pomeranian’s latest pet bed! 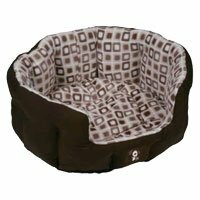 This entire dog bed is machine washable! What’s not to love?! First of all, I love Allrecipes.com! 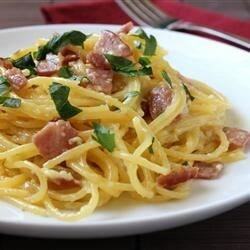 I recently made this Spaghetti Carbonara dish for the first time and it was delicious and easy! AND both of my girls ate it up mixed with some peas! 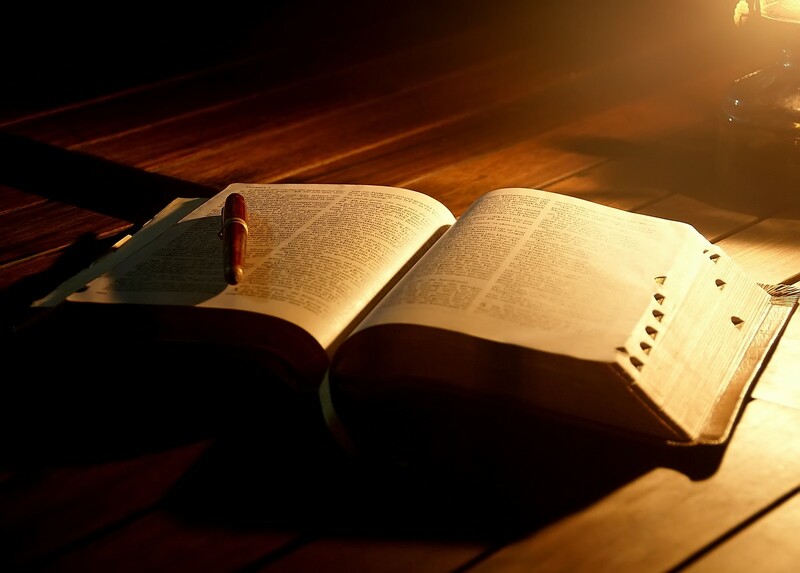 I’ve always struggled with consistently spending time in scripture. 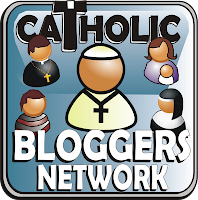 I was happy when I found out about the 90-Day Bible Reading Challenge put together by Sarah Christmyer to celeberate The Year of Faith in the Catholic Church. This daily e-newsletter started in January, but all of the posts are available in the archives on the website. I may not get to each reading every day, but I manage to catch up and hang with the timeline for the most part. After this, I hope to consistently keep up with daily readings on the Laudate app. Love fr. James Martin, read that book too and very good! Awesome! I’ll have to check out some of his other books, too! Love allrecipes! And thanks for the Bible reading link. Great idea for the Year of Faith! I don’t know what I’d do with out allrecipes! I love reading the reviews to get the best tips! Pretty much can’t go wrong whenever bacon is involved! That spaghetti looks delicious! I’m trying shellac for our wedding for the first time and hoping it looks nice! I wish they had shellac when I got married! Everyone I know that has had it done has loved it! The shellac kit looks amazing! never heard of it before. I’ve been looking for great polish that doesn’t chip right away. I just got out of nail rehab (long time nail biter and finally quit) and started painting my nails. drives me crazy when the paint falls off, especially after breaking the habit! thanks for posting that! I’m sure I’ll need to practice a few more times to really get it down, but so far so good! 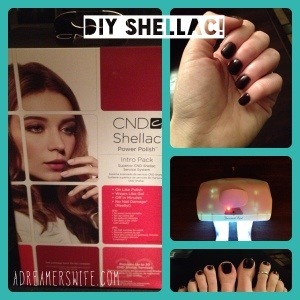 Danielle Bean has been encouraging me to try Shellac for years. I don’t know why I haven’t gotten around to it yet. I love the idea of not having to worry about my nails for 2+ weeks! Thanks for joining in, love!